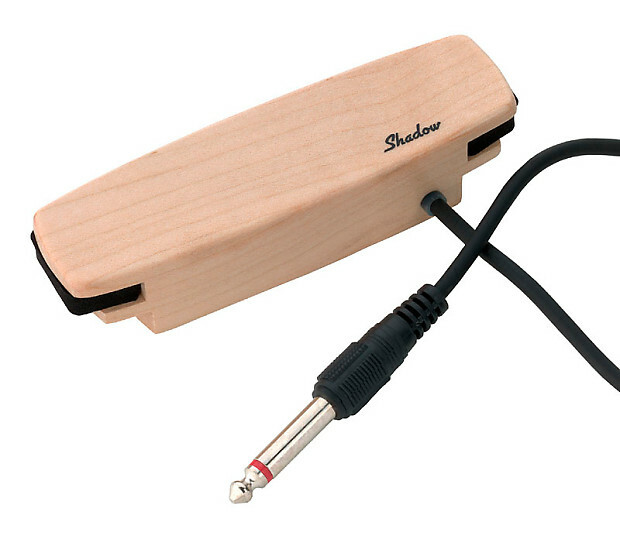 The Shadow SH 330 has for many years been the world's most popular quick mount soundhole magnetic pickup. The SH 330 is a well shielded single coil pickup in a beautiful maple wood case with natural finish is vacuum waxed and sealed in epoxy. A 12 foot (4m) noiseless instrument cable is attached, ready to plug directly intoyour amplifier. The SH 300 installs very easily and can be removed at any time. The pickup can be rotated in the sound hole to allow fine tunings of harmonic response. Shipping days are Monday through Friday, excluding holidays. Most orders are shipped the same day if the order is received before 2:00 PM Pacific time (GMT-0800). For fastest service, please include a daytime phone number in case we have any questions about your order. We can ship to a PO box or any valid street address. We do not provide walk-in service, but local shipments to the San Diego area will normally arrive very quickly. 2-DAY SHIPPING - If available, 2-Day shipping will normally arrive in two business days (Monday thru Friday) to most areas after shipping. Please allow an extra day for delivery to some areas depending on USPS availability in that area. NOTE: We reserve the right to add Signature Confirmation to any order at our discretion. INTERNATIONAL SHIPPING - We can ship this item to almost anywhere in the world using via USPS PRIORITY MAIL INTERNATIONAL which is trackable and insured, about 2-3 weeks delivery to most locations depending on time spent in Customs. USPS delivery times are estimates and do not include delays caused by Customs or local delivery services. USPS FIRST CLASS MAIL INTERNATIONAL - We now offer USPS First Class Mail International shipping to Canada by request, trackable and insured, about 2-3 weeks delivery. We may also be able to ship using First Class Mail International to the following countries, by request only: Australia, Belgium, Brazil, Croatia, Denmark, France, Germany, Great Britain, Israel, Netherlands, New Zealand, Spain and Switzerland. Please contact us for availability of this shipping option before purchasing. SHIPPING LOCATIONS: We are not able to ship to some countries, including (but not limited to) the following: Bahrain, Belarus, Bolivia, Falkland Islands, Ghana, Guatemala, Iraq, Kazakhstan, Kuwait, Niger, Nigeria, North Korea, Russia, Turkmenistan, Ukraine, Uzbekistan, Yemen. If you are in a country that we are unable to ship to, your order will be cancelled and a refund issued. As an alternative, you might consider having your order shipped to a friend or relative within the United States or to a reshipping service. IMPORTANT! If you have any questions about international shipping, please contact us BEFORE purchasing this item. We ship very quickly, and may not be able to make changes to your order after the order has been placed. Returns - Returns are accepted within 30 days for brand new, unopened items with all of the parts and packaging in original condition. We do not accept returns once a product has been used or installed, if you are having a problem with your product please contact us for assistance. Our original shipping and handling costs are not refundable. Please contact us for a return authorization before returning any items to us.